I went out on the back patio earlier this evening and it really dawned on me. After more than 30 years of having cats in our lives suddenly there are none. Now, thanks anyway, but no condolences are needed. We haven’t had any real pet cats since the late 90’s. THAT’s when condolences would have been welcomed. We had 3 that lived for 18, 19 and 20 years. I’ll have to write some other time about how the oldest one (my cat) used to sit on the Japanese bridge over the fish pond in our old back yard and dream of catching Koi. But I digress…. 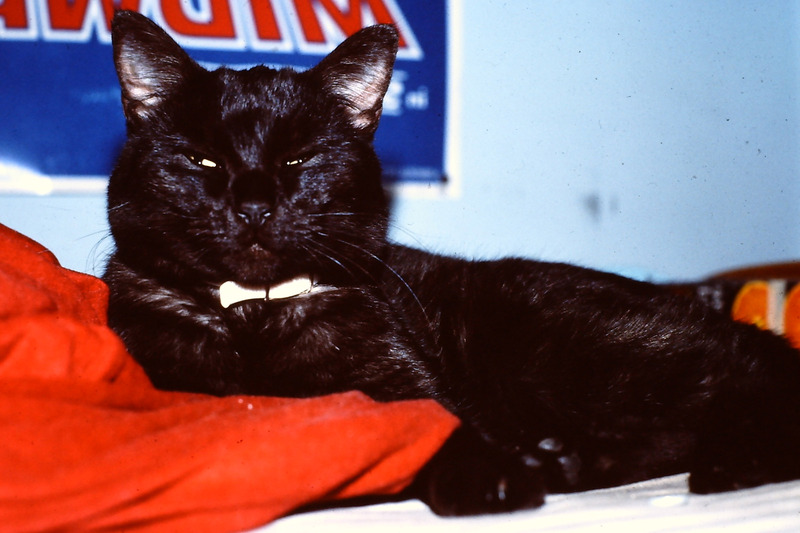 Sometime in those same late nineties a tiny mostly black cat took up residence in the back yard. She wouldn’t let us come near her. She would hiss and bristle then take off like a shot. Not just skittish, she was feral. So of course we started putting out food after a couple of days and she was still there. Thought maybe she had a home somewhere else. Once that first bowl of feline fuss budget special mix was set out there was no turning back. She was feral but she wasn’t crazy. We started talking about trying to catch her and take her to a vet – instead she surprised us with a litter. Of course we couldn’t get near any of them either. I started to worry about being overrun with cats and someday we may want to sell the house and we’d have to disclose there’s a cat problem – by then there’d be multiple generations and oh – maybe a few hundred – so my imagination conjured up. So we planned to catch all 4 and do the vet thing. Couldn’t get the job done ourselves so we hired a guy who specialized in trapping. He was quite efficient. We had them all to the vets for shots and surgery and back in the yard quickly. (The kittens were old enough by the time we hired this guy who appeared in the newspaper a few years later after he’d been arrested for murder – but that’s another story. Again I digress.) So now, after supplying these critters food and water and a lovely patio to take over they have all gone on their way one by one. They really did have cushy lives for ferals but also obviously knew how to take care of themselves to live as long as they did. Am I wistful? A little, I’ll admit. BUT this weekend I’m going out there with a bucketful of cleaning stuff and occupying the yard. It’s going to be beautiful once more on the patio with no cat hair!! I loved that cat !! We had her 19 years – she’s been gone since ’98 or so.